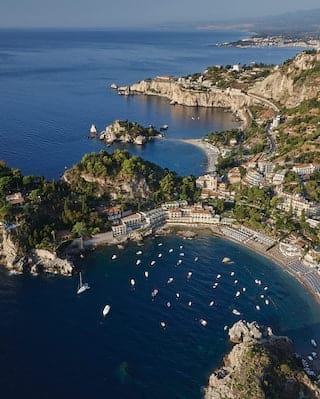 Staying with us turns a trip to Taormina into an unforgettably unique escape. Here are just some of the features that make us stand out from the crowd. 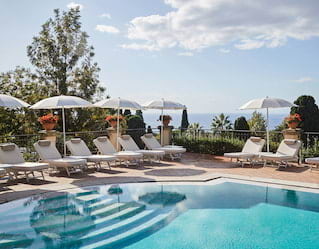 The heated, panoramic swimming pool is surrounded by beautiful terraced gardens. It’s the perfect place to sit back and relax after exploring the streets of Taormina. 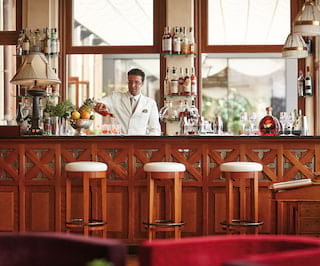 Our Poolside Bar is open daily in the summer for drinks, cocktails and snacks. Please note that the pool will be closed from 1 December to 3 January. 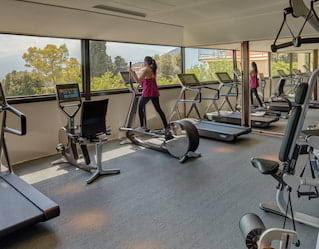 Stay active in the Fitness Centre at our hotel or at Belmond Villa Sant’Andrea. Both are fitted with new Technogym equipment and a variety of exercise machines to help you maintain your exercise regime. 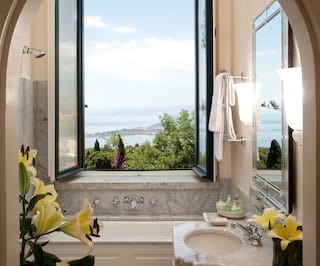 Belmond Grand Hotel Timeo shares facilities, including restaurants and bars, with Belmond Villa Sant'Andrea, our sister hotel in Taormina. Located 5km away, it sits beside its own private beach. 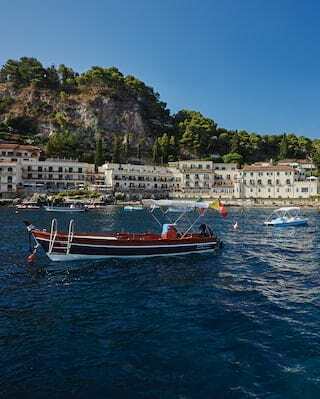 A private, complimentary shuttle links Belmond Grand Hotel Timeo and Belmond Villa Sant'Andrea. Our staff will be delighted to provide you with the service schedule. Soak up the sun as you sail around the Sicilian East Coast on our complimentary boat excursions. Tours depart daily during the summer. 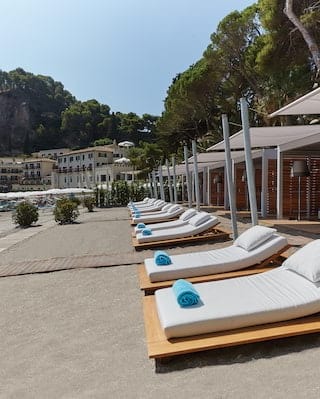 Relax and unwind on the private beach at Belmond Villa Sant’Andrea. Take the shuttle service and settle into one of the complimentary sun loungers. A Beach Bar is open during the summer months to keep you refreshed. 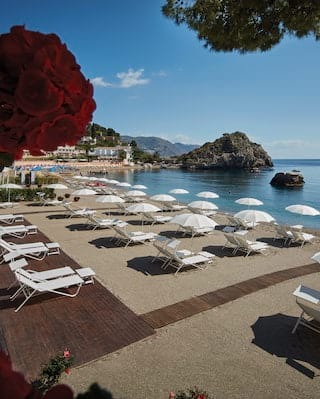 Hire a private beach cabana and retreat to a personal sea-side sanctuary at Belmond Villa Sant’Andrea. 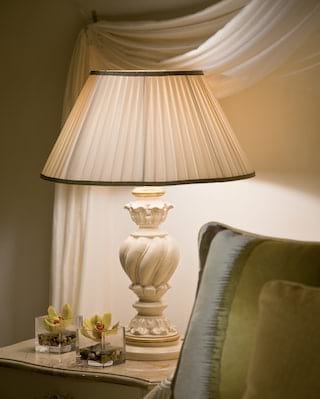 Perfect for up to four guests, each is equipped with a comfortable sofa, table, minibar and loungers. 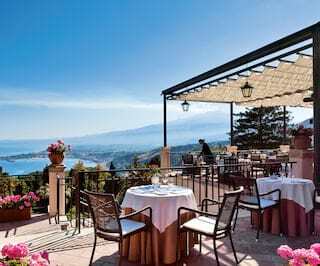 Keep little ones entertained with the Smile Club at Belmond Villa Sant’Andrea. From sand castle contests and fun games on the beach to cannoli-filling lessons, children will have hundreds of stories to share with their friends. We can also suggest fun activities for families, from boat excursions to adventurous treks. The Smile Club is available from May through October.